July kicked-off my 10-week training program for the Lake Geneva TriRock Triathlon in Williams Bay. I’m excited to take on the International distance triathlon in September; 1500 meter swim, 28 mile bike, and 6.2 mile run. My training plan for this race is really simple, and uncharacteristic. I run and bike when I have the opportunities during the week, and swim on the weekends when I’m in Lake Geneva (which may only be 4-5 open water swims before the race on September 13). It’s a far far cry from my pre-children triathlon training days when I competed in longer distance triathlons, and had detailed training schedules in order to achieve a time goal. But this being my first triathlon in seven years, I’m just really excited to return to the sport I love, and content having an unstructured training plan. The last two weeks have been a little bit of a roller coaster ride. After the July 4th weekend and training on the hills, my hamstring flared up once again (it’s been an ongoing issue since March 2013). I ended up taking five days off from all activity to let it rest. While my hamstring is not perfect, it currently feels well enough to run, bike, and swim at a moderate intensity. 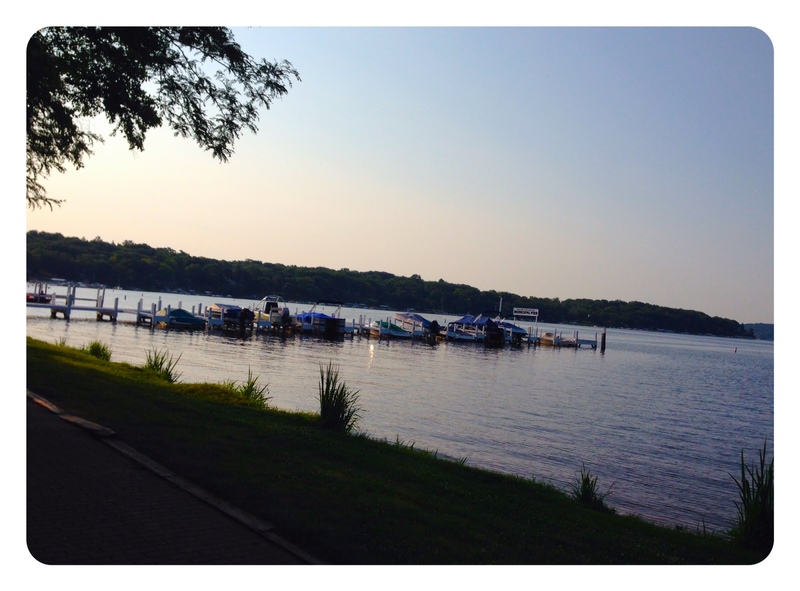 My training goal for the weekend in WI was to complete at least a 30-mile bike ride, a 5-6 mile run, and a 20-minute open water swim in the lake (which is much different than swimming laps in a pool). 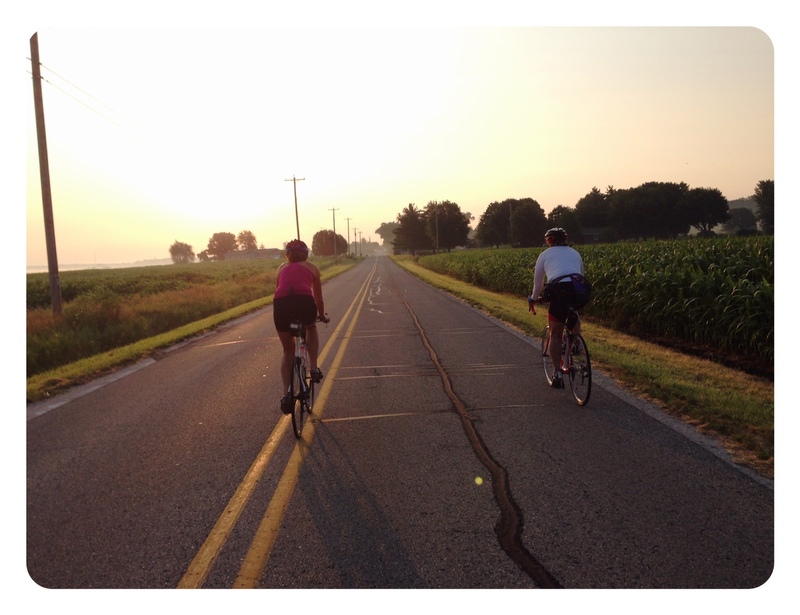 I really enjoy riding my bike in WI because of the traffic-free roads, rolling hills, beautiful views, and because I have a built-in training partner – my husband’s aunt! 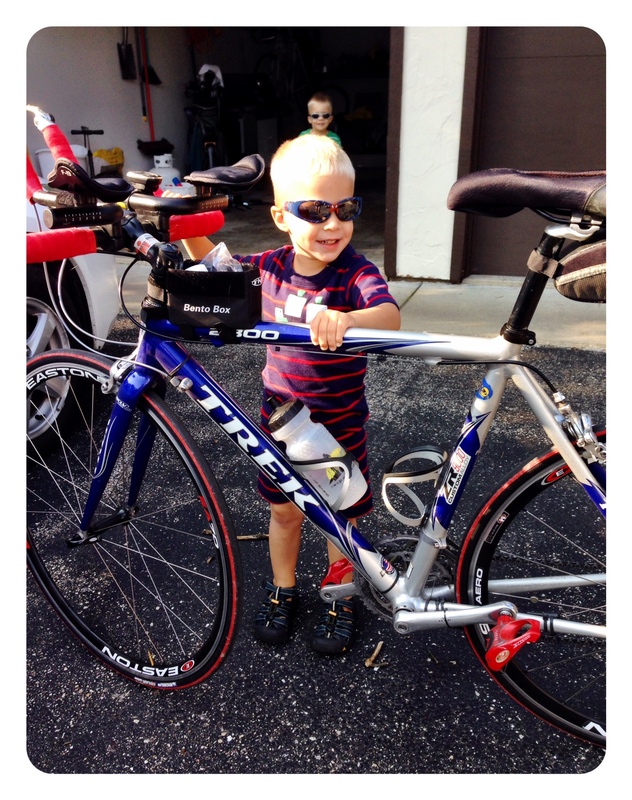 She is also registered for the triathlon in September, along with her adult son! So when I arrived in Geneva Lake on Friday, I immediately reached out to Aunt Barb to plan our training ride for the weekend. The alarm clock rang at 4:51am (no joke!). 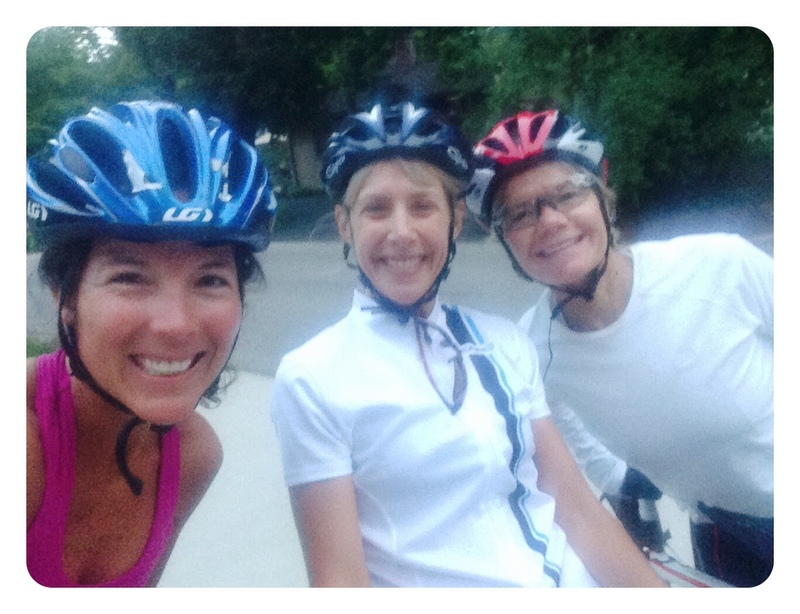 Aunt Barb and her friend Margaret were riding at 5:30am to complete 30-miles before 7:30am. Blurry-eyed, I rolled out of bed, fumbled into the bathroom to get dressed, french-braided my hair, ate a breakfast bar, and headed to the garage to pump air in my tires. I rode out at 5:25am to be our meeting spot on time. You cannot be late for a ride, no one is ever late for a group ride, ever. The morning was crisp, 55 degrees and there was a hint of morning mist in the air. Even though its really early, its invigorating to be up and rolling at sunrise. I love, and long for these warm summer days. Three riders, representing the third, fourth, and fifth decade of life! I discovered along our ride that Margaret is a six time Ironman and she does outrageous things, like swim the distance of Geneva Lake (8 miles!) for fun. And Aunt Barb was a professional tennis player in her younger years and has joined Margaret on her fun(?) swims across Geneva Lake. I’m in the company of two fabulous athletes. Aunt Barb had our route mapped out for the morning. We completed 30 miles on a beautiful stretch of rode that took us along side Geneva Lake and Lake Como. As anticipated, we finished at 7:25am, right on time. My legs felt good and I wanted to push my pace and tackle more hills. I decided rather than head back home I would add 10 more miles to my ride. The 10 extra miles was just what I needed. It was 8am and I rode back to our condo and was greeted by my support crew. Ironically my husband and boys just returned from the local store with 36 ounces of coffee and a donut (because We’re A One Donut Family). I exchanged my helmet for a hat, cleats for running sneakers, and I took off for a one-mile run to get my legs conditioned for the bike to run transition on race day. Surprisingly I ran that rolling hill mile in 8:07. Legs are feeling good, and my nap at 2pm felt even better. The alarm rings at 5:41am. I roll out of bed and get myself ready for a run and swim. I had to be back by 7:30am to allow my husband time to go out for his bike ride. This weekend we have no built-in babysitters. Nana and Papa were not here with us, so we do what we do in Chicago, tag team our weekend workouts. 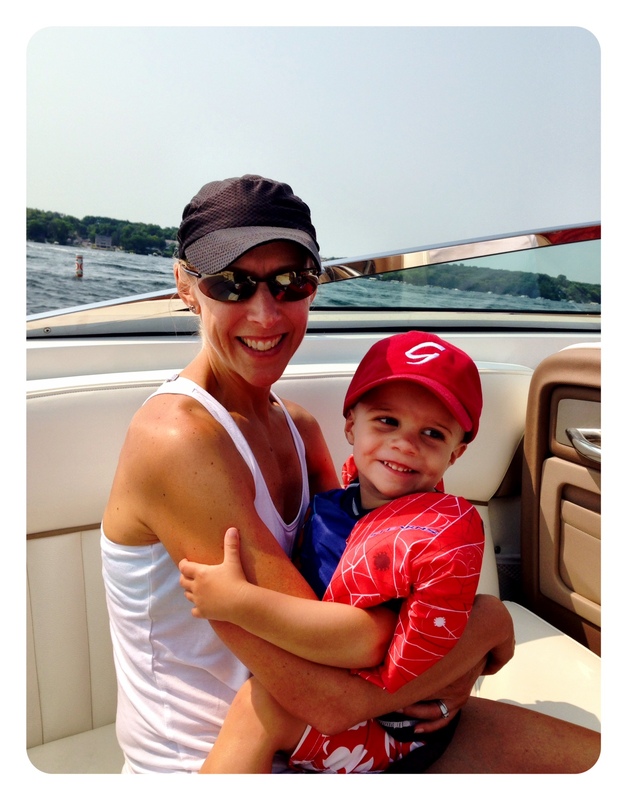 The day’s time was tight because we had fun plans to go out boating with family! The night before I studied the run course for the triathlon (all course maps are usually posted on the race’s website). The run course is a 18-turn, zig-zag, uphill run for 3.1 miles, and then it makes a u-turn and follows the same path downhill to the finish line. Ouch. That’s a LOT of turns, and a lot of hill to conquer, both up AND down. My plan for the morning was to run to Williams Bay beach (5 minutes away), drop off my googles and swim cap, head out for a 40 minute run, and then return to the beach for 20 minute swim. I quickly dropped off my small pack that contained brand new Aqua Sphere mask and swim cap and headed off for the 3 mile trek uphill. I ran for 30 minutes and proud to say I never stopped to walk. I had an abundance of internal dialogue in my head, and negotiated my outbound run to 35 minutes as I would take the direct route back (1 mile downhill) to the beach to swim. My legs, particularly my hamstring, felt okay and thought the swim would help loosen my leg muscles. When I arrived at the beach I was heartbroken, flabbergasted, and disappointed to see that my bag I had left with my gear in it was NOT there! What?!?! At 7am there were a few more people out and about, including a worker riding the tractor to rake the beach. I asked him about my beloved bag (the one I received after completing my first Ironman!) and he helped me look for it, along with the other gentleman at the boating station. No bag. No goggles. No cap. No swim. I was (and still am) heartbroken that someone would take my gear in the charming little community of Williams Bay. I was more disappointed that I couldn’t go for the swim I was anticipating, and eager to complete in the tranquil water. I ran back home and tagged team my husband so he could go out for his bike ride. 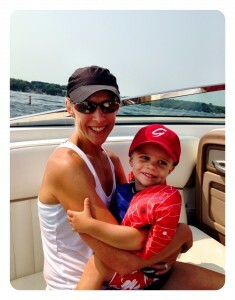 We had a lovely boat outing in the morning with my husband’s aunt and uncle. When we returned to the dock, we went to a popular organic market for sandwiches and picnicked next to the lake with the boys. It was THE perfect summer day – perfect weekend – but there was still something missing. We returned home to give the boys their nap. I starting packing up our bags, cleaned up the ginormous mess we managed to make in 48 hours, and did a load of laundry prepping for our trip back to Chicago when the boys woke up. It was now 2:30pm, and the internal dialogue in my head was relentless. I was in Geneva Lake to swim. 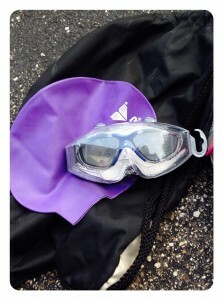 I could go back to the lake and swim as planned (I had extra goggles, but no swim cap). “So what if there are a hundred people at the beach, and the water is more choppy from wind and boaters. I could still swim. The beach is only 5 minutes away.” I knew if I didn’t go back to the beach to finish my training for the weekend, I would have regrets. So I put on my smelly training clothes, grabbed my goggles, and told my husband I’d be back in 45 minutes. I drove to the bay and placed my bag on the beach feeling optimistic that it would remained untouched. I put my goggles on, and waded into the water. The beach was packed. The water was choppy. There were clumps of seaweed drifting on the top of the water and I just dove in. “There, I did it. I’m in the water dang it, and I’m swimming.” I completed four laps back and forth along the stretch of buoys, extracting seaweed away from my arms and head as I made my way. I stopped a number of times to get my bearings and defog my seven year-old goggles, but I was in the water and I swam for 22 minutes. Mission accomplished! Race day conditions may not be any better, the only difference is that there will be dozens of women swimming along side me, trying to get to the same place I’m going. The majority of them will probably get out of the water first, and my goal will be to pass them on the bike course. With all life experiences, I was reminded of a few things about myself this weekend; I am determined, fiercely dedicated (sometimes stubborn), and enjoy pushing my physical limits. Mind over matter. As for my next swim in Williams Bay, I’ll be driving to the beach to lock my gear in the car while I run. Humph.